We are celebrating our great loving home country’s 100th independence birthday today! On this occasion I want to share my personal enormous thank you to all the Finnish war veterans and women of Lotta Svärd who saved us and kept our independence in World War ][. I will specially send my gratitude and loving thanks to my dear grandfather and veteran Tarmo Kaarlo Olavi Eronen (1922–2017) who passed away this Fall, and to my dear late grandmother Tellervo Eronen. I miss you and dedicate this day to You. The oil painting to the right is from 2007. 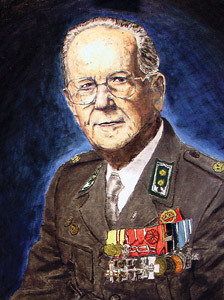 I painted it as a gift to my grandpa for his 85th birthday. In honoring and celebrating this special day, here is my classical symphony Anima Dea featuring our national instrument kantele in a special way. Whooper swan is our national bird and it is one of my great sources of inspiration. In the above national-romantic work (that is originally a fine art etching-aquatint, 2008) the bird also has a wing of kantele. Here, here Finland for another 100 years – and a thousand more! 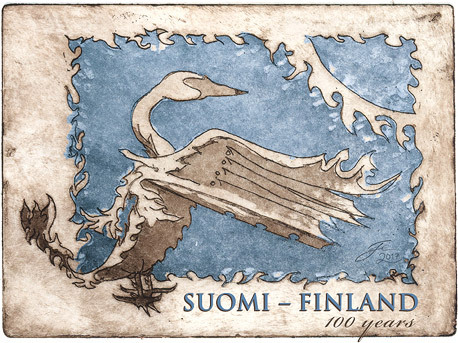 Bookmark this article Happy 100th Birthday Finland!